VIRGINIA BEACH, Va. � The National Park Service, in conjunction with Historic Jamestowne, has made an unprecedented positive gesture to the Nottoway Indian Tribe of Virginia with its commissioned oil painting, �Jamestown in the 1690�s - Changing Times,� by historical artist Keith Rocco. Rocco is an acclaimed artist whose paintings hang in every major collection of historical art in the United States. He worked closely with local experts and historians from Historic Jamestowne to produce the painting. 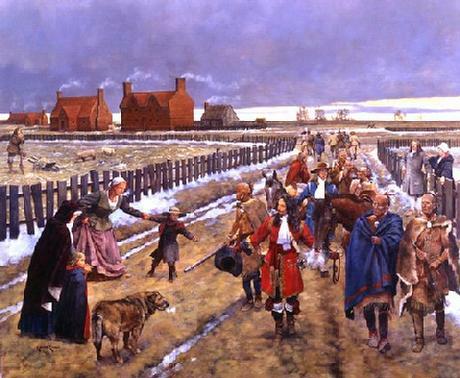 �Changing Times,� depicts the Nottoway tribe making its annual tribute to the Royal Governor of Virginia in 1691. 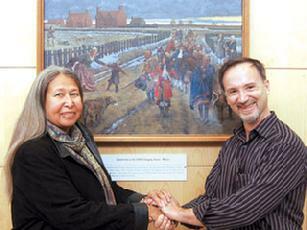 It is the first depicted artwork of native people in the museum since the 1950s. It is the first visual reference of the interactions between colonial people and the Nottoway Indian Tribe. It is also the first time Rocco has portrayed American Indians in his artwork. Rocco, whose expertise is in the 18th and 19th century, admitted the time-period was not his forte, but with extensive research was able to create an impressive finished product. At the Historic Jamestowne visitor�s center, Rocco held a presentation to discuss the painting, his personal methodology, research techniques and earlier works. In attendance of the presentation was chief of the Nottoway Indian Tribe of Virginia, Lynette Allston. She was thrilled by the painting. �It�s a beginning,� Allston said. �There is a lost portion of history, particularly in historic art. To have this historical painting of our ancestors is monumental. It is the start of what will probably evolve into more writing and more examination of the Nottoway Indian Tribe of Virginia. From that point forward, Rocco and the NPS worked together to create �Changing Times,� a painting that is a piece of history in many ways; it is now on display at the Historic Jamestowne Visitor Center in Virginia. To obtain a print of �Changing Times,� for $2.95, contact the Historic Jamestowne Museum Shop at (757) 229-9973.